In this tutorial you will learn how you can make your AbanteCart powered store get more easily recognized by the Search Engines and gain more clients. AbanteCart’s user-friendly admin interface offers easy management of the Search Engine Friendly URL settings which we will detail in this tutorial. 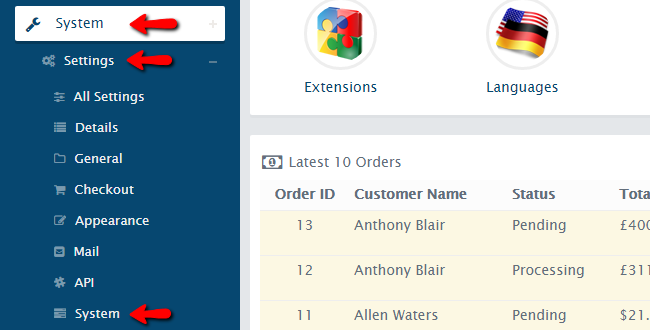 In order to enable the Search Engine Friendly URLs, you will need to login in your store’s backend area and navigate to System>Settings>System from the menu located on the left side of your screen. Note that the Settings menu will appear shrinked and it will expand after you click on it. After navigating to the System Settings Menu you will be able to see several different System options and one of them will be the Use SEO URLs which you are looking for. You should now switch the option to On in order to active the SEF URL. Please make sure that you saved the new setting from the button which will pop-out on the right side of the option. After you have saved the changes you made, your AbanteCart store is now successfully configured to use Search Engine Friendly URLs. Congratulations! You can now successfully activate/deactivate the SEF URLs of your AbanteCart!